Unique Qualities: A Real Life Changer! Flax fibers absorb moisture very well, in fact, linen fabric can absorb up to 20% of its own weight in water! 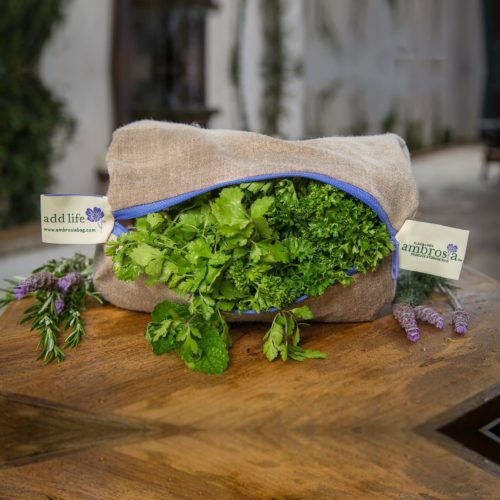 The flax fibers of our damp bags not only hold onto the moisture when stored inside the refrigerator drawer they release moisture back, keeping vegetables and/or herbs alive from continuous hydration, unlike other natural fibers. 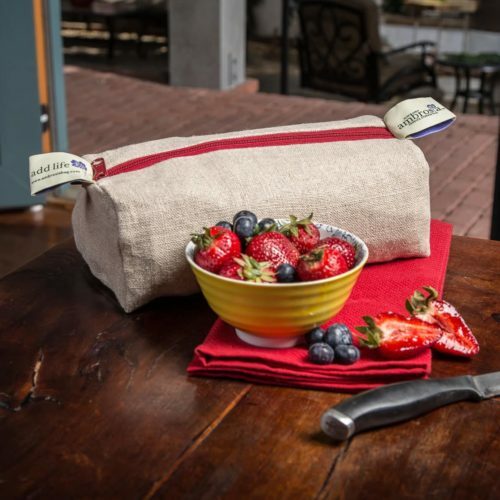 Flax linen has hollow structure fibers that allows for air to flow in and out of Ambrosia Bags. The lack of oxygen stops respiration (breathing) and decay of the produce will set in causing yucky slime. What’s more, absence of oxygen can cause fermentation to occur which will produce strong off flavors. The unique hollow fibers of flax linen also take in environmental temperatures. 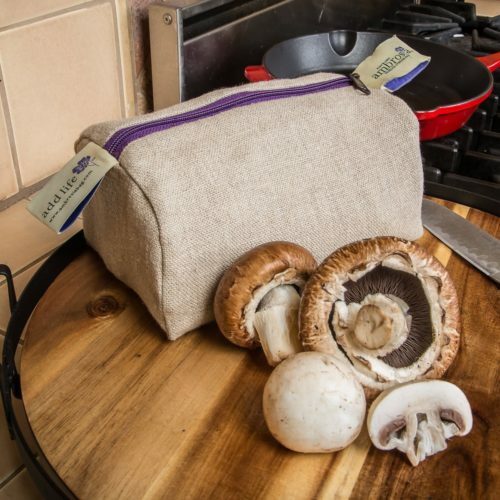 Refrigeration of damp linen Ambrosia bags, stored inside the vegetable drawer, allows the hygroscopic nature of flax fibers to remain moist. 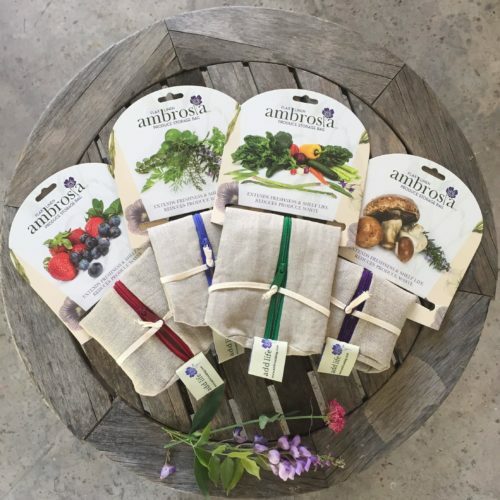 Ambrosia flax linen bags inhibit the formation of ethylene gas to prolong the life and freshness of produce. Most vegetables and fruit release ethylene gas after harvest, a natural process which accelerates aging and ultimate deterioration of produce. Flax Linen is of the oldest fiber textile in recorded history dating back 10,000 years. 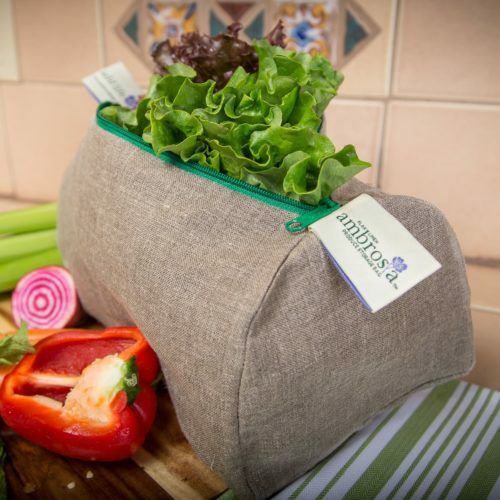 Ambrosia bags inherent strength and durability is heirloom quality meant to can be passed down to the next generations. Our Belgian linen mill has a long tradition of making top quality linen. They use the highest ecological standards and socially responsible methods to process linen. Flax requires little energy, water or resources to grow, little to no fertilizers or pesticides. All parts of the flax plant are used, leaving no waste footprint and no toxic by-product processing.